The food we feed our pets is very important. The better the food, the less they need. I personally like to combine a couple of different methods to feeding my five dogs and two cats. I love to cook, so I will often take a whole short grain brown rice and cook some with a few vegetables that my family loves. My dogs love broccoli, carrots and celery - I don’t use these every day - but love to mix it up for them. To this I add a raw diet, egg (from my own free range chickens) & some dry dog food. I have researched these companies and feel safe feeding them. Some of them use free range, wild caught fish, are grain free and are non GMO. I hope this has helped. 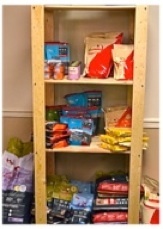 We carry these companies and will be more than happy to order in the food that is special for your companion. Please feel free to contact me with any questions or comments.